While I’m a sucker for Disney musicals, after four straight years of Beauty and the Beast as the annual Christmas musical at the Arts Club, it was time for a change. This year’s holiday production at the Stanley is White Christmas, the 2004 nostalgia-laden stage adaptation of the 1954 Bing Crosby and Danny Kaye film. The show’s book, by David Ives and Paul Blake, although only five years old, doesn’t stray too far from the original, nor does it attempt to insert any sort of modern sensibilities. If you’re searching for any overarching larger themes or social messages here, don’t bother. White Christmas is a throwback to a simpler time when pretty much any problem could be solved by simply mounting a Broadway-style revue. Is war getting you down? Facing foreclosure and financial ruin? Put on a show! 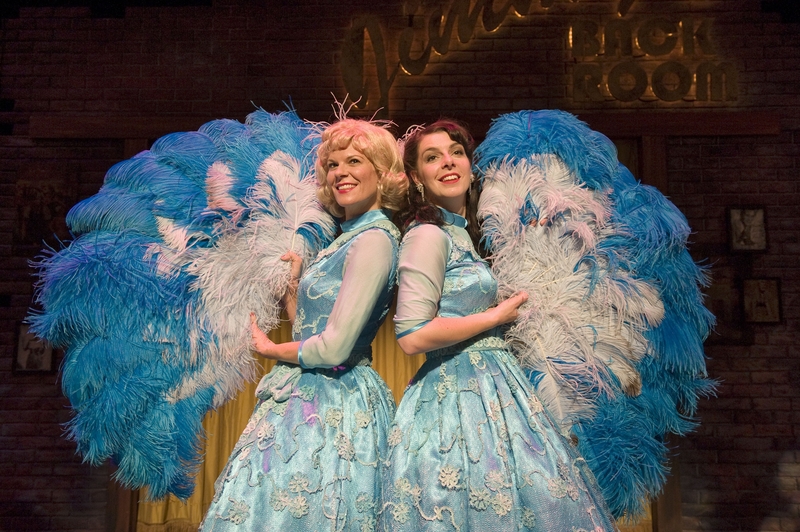 Monique Lund and Sara-Jeanne Hosie in the Arts Club Theatre Company’s production of Irving Berlin’s White Christmas: The Musical. Photo by David Cooper. In this instance, retired army buddies turned musical stars Phil Davis and Bob Wallace, played by Todd Talbot (Annie, TUTS) and Jeffrey Victor (Les Misérables, Arts Club), decide to help out their former commanding officer General Waverly. Waverly, as played by Réjean Cournoyer (Les Misérables, Arts Club), has sunk all of his money into a Vermont inn and is about to lose his shirt due to unseasonably warm weather and a lack of snow to placate the tourists. Arts Club veterans Monique Lund (Beauty and the Beast, Arts Club) and Sara-Jeanne Hosie (Les Misérables, Arts Club) are sister act Judy and Betty Haynes who join forces, professionally and romantically, with song-and-dance duo Davis and Wallace. Talbot and Victor have better onstage chemistry together than they do with Lund and Hosie respectively, which is perhaps a more unintentionally faithful following of the buddy-musical film genre than intended. After playing Mrs. Potts for the past four Christmases in Beauty and the Beast, Susan Anderson easily breaks into her new role as busybody Martha Watson. Anderson takes the opportunity to show off her vocal and dance skills in “Let Me Sing and I’m Happy” and exceeds all expectations, in what should be a supporting role. In an already markedly strong chorus, Jak Barradell, Jeremy Lowe and Laura McNaught stand out from the pack with their energy and charisma. This show’s strength comes shining through in the big group dance numbers including “Let Yourself Go” and “I Love a Piano.” Valerie Easton’s choreography is a loving tribute to the old movie musicals that have long since fallen out of fashion, where dancers once hoofed and tapped energetically for the cameras, broad smiles not wavering for a single beat. White Christmas is as warm and familiar as an old friend and seems destined to become another Arts Club holiday tradition. Arts Club Theatre Company presents Irving Berlin’s White Christmas: The Musical until December 27, 2009 at the Stanley Industrial Alliance Stage, 2750 Granville St. Tickets are available online or by phone at 604-687-1644. Christmas is coming early to Vancouver this year. 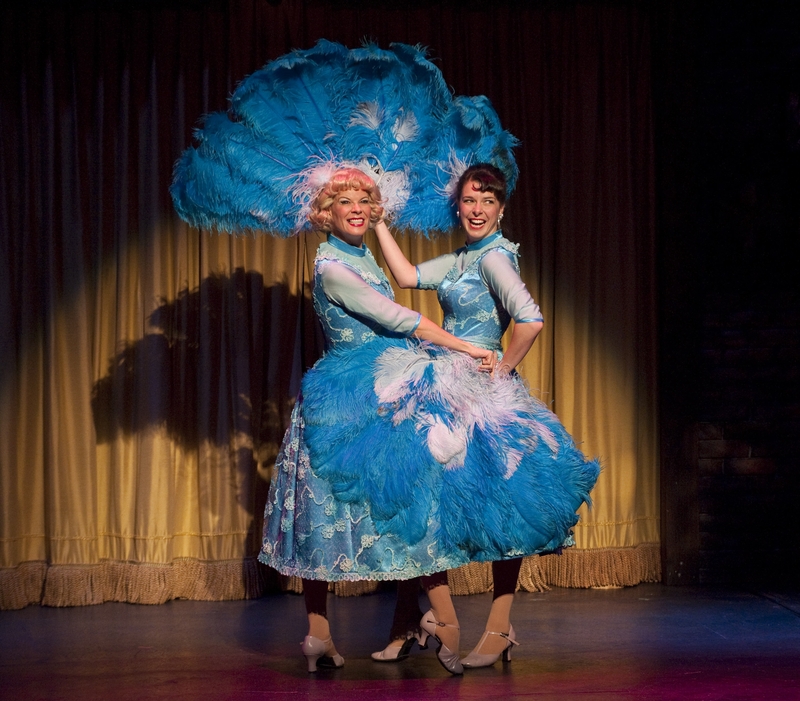 The Arts Club production of White Christmas begins previews tonight and opens officially November 18th, 2009. Todd Talbot, Laura McNaught, Jeffrey Victor, Sara-Jeanne Hosie in the Arts Club Theatre Company’s production of White Christmas. Photo by David Cooper. Starring Sara-Jeanne Hosie (Les Misérables, Arts Club), Monique Lund (Beauty and the Beast, Arts Club), Todd Talbot (Annie, TUTS), Jeffrey Victor (Les Misérables, Arts Club), Susan Anderson (Beauty and the Beast, Arts Club), Réjean Cournoyer (Les Misérables, Arts Club), with Robert Allan, Jak Barradell (Altar Boyz, Arts Club), Darren Burkett (A Chorus Line, RCMT), Adam Charles (A Chorus Line, RCMT), Anna Kuman (A Chorus Line, RCMT), Jeremy Lowe (Les Misérables, Arts Club), Kristie Marsden (Company, Arts Club), Marianne McCord, Laura McNaught (A Chorus Line, RCMT), Keri Minty (A Chorus Line, RCMT), Shane Snow (The Full Monty, Patrick Street), Fiona Vroom, Mark Weatherley, and Rachael Withers (Les Misérables, Arts Club). Arts Club Theatre Company presents Irving Berlin’s White Christmas: The Musical from November 24– December 27, 2009 at the Stanley Industrial Alliance Stage, 2750 Granville St. Tickets are available online or by phone at 604-687-1644.